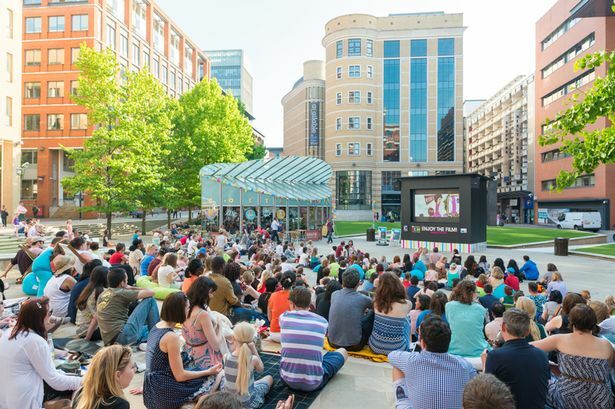 Birmingham&apos;s business community is being called to action to vote for its favourite film to be shown as part of this year’s outdoor Film Festival at Brindleyplace . The annual movie screenings, which this year have an 80s v 90s theme, will take place between July 7-13 in Central Square and are free events. Last year’s festival attracted more than 12,000 visitors, making it Brindleyplace’s most successful event to date. The city’s business workers and general public are being asked which films should be shown and since opening nominations last week, Brindleyplace has already received more than 2,000 votes, with Mrs Doubtfire, Top Gun, E.T. and Toy Story 2, currently in the top spot. Lydia Ellis, marketing manager at Brindleyplace, said: “In just the space of a week, we’ve received double the amount of nominations we got last year which is fantastic and shows just how much people have really got behind the Film Festival. “This year, we decided to add a competitive edge to the festival, pitching films produced in the 80s against those that were made in the 90s. At the moment, the decade with the most votes is changing daily, so if you want to make sure that your favourite film is shown you need to get casting your vote now. Brindleyplace has compiled a shortlist of its top films, including Top Gun, GoldenEye, Mannequin and Aladdin. Those films that receive the most nominations will be the ones shown, as well as any additional films that receive multiple nominations. A full list is available to view on the Brindleyplace website ( www.brindleyplace.com ). To add to the cinematic experience, there will be free popcorn (on a first come first served basis) for those watching the films. Takeaway food from various restaurants across Brindleyplace will also be available. Owned by Hines Global REIT and Moorfield Group, Brindleyplace is home to 27 businesses, including Deutsche Bank, RBS and Deloitte.